OAKWOOD - Charles Winston Merritt, 79, died Sunday, Sept. 5, 2004, in a Macon hospital. Services will be at 11 a.m. today in Williams Funeral Home Chapel with the Rev. Bill Neely officiating. Interment in Georgia Veterans Memorial Cemetery. Mr. Merritt, a native of Irwin County, made his home in Hall County for the past 30 years. He was a veteran of the U.S. Army, having served in World War II with the 82nd Airborne Division. He was also a graduate of the University of Georgia and was a retired pharmacist from the North East Georgia Regional Medical Center. Survivors include his wife, Bertice Lee Merritt of Oakwood; two daughters, Faye Maxwell and husband Alan of Milledgeville and Shirley Bledsoe and husband Roy of Nashville, Tenn.; a son, Charles "Chuck" Merritt of Oakwood; two sisters, Georgann Winslow and Joyce Carter, both of Fernandino Beach, Fla.; three brothers, Don Merritt of Brunswick, Wendell Merritt of Fitzgerald, and Ralph Merritt of Seattle, Wash.; four grandchildren, Tom Maxwell, Melissa Bledsoe Harris, Amanda Bledsoe and Allison Merritt. 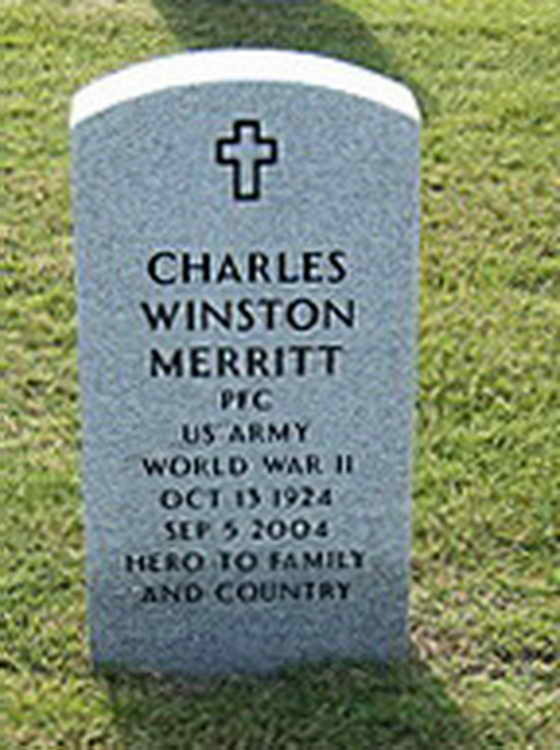 Grave marker for Charles W. Merritt in the Georgia Veterans Memorial Cemetery, Milledgeville (Baldwin county), Georgia. Charles enlisted in the Army at Fort McPherson, Atlanta, GA on 2 August 1944 and volunteered for parachutist duty. Pvt Merritt was transferred to Co A, 508th PIR from the 51st Reinforcement Battalion on 23 April 1945.